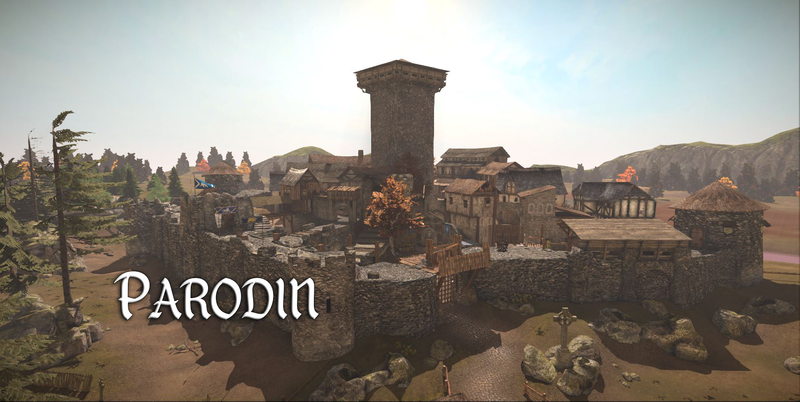 The Mason’s squealers and informants inside Agathian held territory have notified the Order that a big convoy of prisoners of war has made a stop outside one of Parodin’s cities, which stands out by its main keep or “donjon” and an old and vulnerable perimetral wall. Agatha’s Knights are busy collecting taxes in this commercial hub and are organizing a public execution ceremony for several Mason high rank nobles. The Order has cautiously crossed the mountains with the necessary siege equipment and launches a surprise attack on the unwary garrison. Raise the gates. Masons must climb the wall by any means at their disposal (siege tower, ladders & knockable trees) and raise the 2 portcullis. Steal their gold coins! Masons must grab Agatha’s gold bags and run back to load the cart. Looks pretty great. I like the characteristic enviroment and I think the big tower in the middle creates a unique looking castle. This overall makes for a visually interesting map (which is important). Maybe the last objective should be reconsidered though? Would feel a bit unreasonable to make such a big deal out of stealing some gold coins. Although of course it could be excused as taking advantage, considering you’ve already weakened the city’s defenses I guess, I dunno. We considered different alternatives for the last stage, but we liked the idea of a Mason ransack of the village. The central keep or “donjon” (in french) was a very defensive structure of the middle-ages. It was the main warehouse of the town (storing enough supplies to hold out for months) and its door was usually on the first floor to avoid battering rams etc. In fact, I got inspiration from one built in the small hamlet of Abizanda (which is worth visiting & found in Aragon, Spain) that suffered several unsuccessful sieges. This is the reason why we thought it would be more plausible to set a “razzia” battle… a sort of hit n’ run surprise attack where Masons descend from the mountains, liberate some prisoners from the cage carts and plunder the village (taking 8 gold bags that had been piled near the tables used to collect taxes, being Parodin one of the richest regions in the game’s lore). I think its a modest map in terms of objectives, but it has a very interesting assault on the wall in the 2nd stage, which is one of my favourite battle scenes from the middle-ages (my other maps… Belmez and Whitenest also feature them). Stealing the gold bags is also a new objective that creates a very interesting gameplay with players gathering in a sort of rugby melee until on of them grabs the loot and runs back (we still need to fix the lootbag attachment “float” problem). Anyway, I’m open to implementing changes, so any suggestion of an alternative/additional objective is welcome! Looks very nice, good job! Well, I guess I shouldn’t doubt that this will be good. Belmez is the best map in CMW IMO lol.